I love coffee and chocolate together. I remember the first time I had chocolate covered espresso beans. I bought a big box of them from Trader Joe’s because I thought they’d be a good study snack. I sat down at my desk and tossed a couple into my mouth. Chewing, my eyes grew wide with excitement. “They tastes like mochas!” I said, smiling a big, goofy, open-mouthed grin. I continued snacking on them while studying. Sometime later, around midnight, I realized I’d eaten half the box . . . it was then I remembered that they were caffeinated . . . In preparation for the fast-approaching school year, I’m working on my caffeinated study snacks. In general, it’s difficult to find truly vegan chocolate covered espresso beans. So my latest attempt is a cookie based on the flavors of those delicious nuggets of joy. There’s an ingredient in there that may be a surprise: ground coffee. Yes, you can eat coffee beans. No, the texture isn’t off putting. Yes, there is a lot of caffeine in them . . . that’s why they’re in there. You want to use a really high quality coffee in this recipe. You’re going to be tasting the beans themselves, not just a drink brewed from them, so they better taste pretty damn good. I used Peace Coffee French Roast beans. They’re my favorite, and I’m a fan of ethical coffee. This recipe is based on one I found on VegWeb a while ago and have been using pretty much exclusively for my chocolate chip cookie recipe. 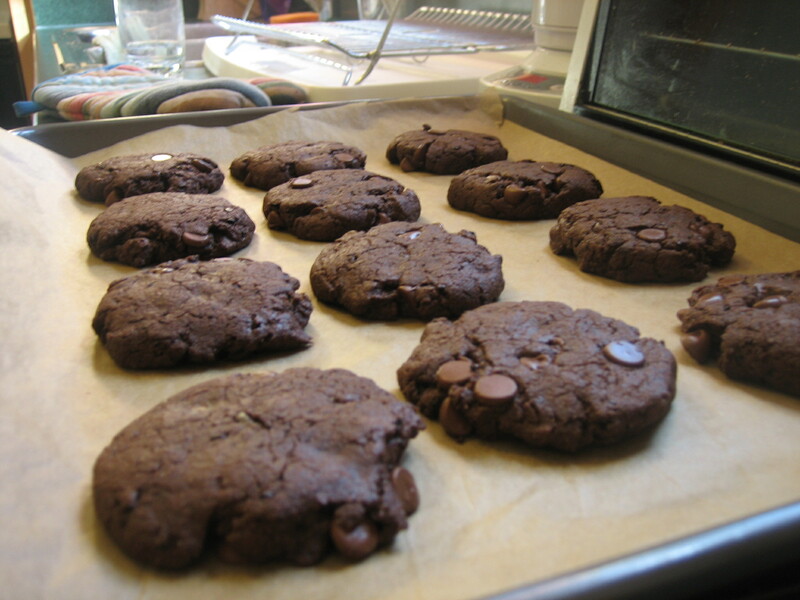 Happy Vegan Chocolate Chip Cookies are pretty much the standard when it comes to vegan cookies. So they made a good base for this recipe. The Dry . . . The Wet . . . Your beans should look about like this. Click to enlarge. Preheat your oven to 35o degrees Fahrenheit. In a large bowl, whisk flour, baking soda, salt, and cocoa powder together until thoroughly combined. Stir in chocolate chips. In a good ol’ fashioned blade style coffee grinder, give the coffee beans about 5 1-second pulses. I shake the coffee grinder a bit between each pulse, just to make sure things are more or less evenly ground. You want a really coarse grind on the beans, but you don’t want chunks so big that when you bite into the cookie you feel like you’re crunching into beetles or something . . . eeew. 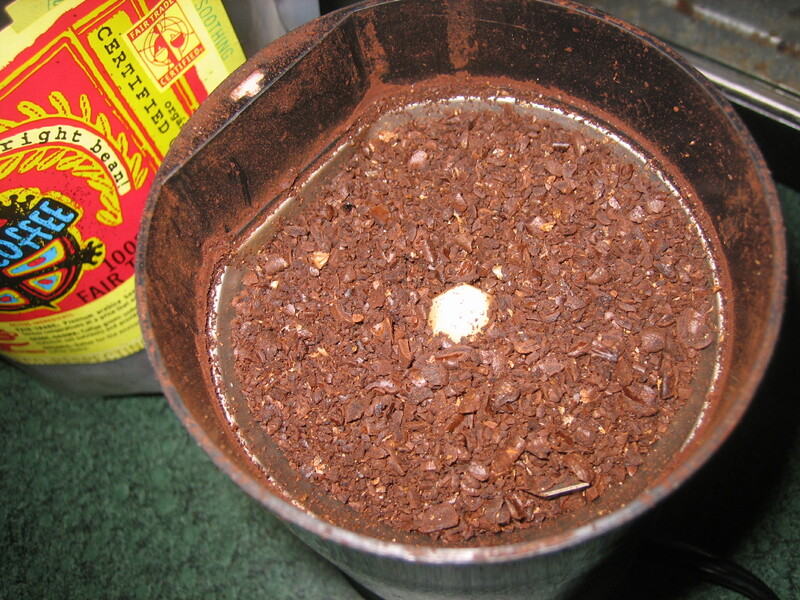 Stir your ground coffee into the rest of the dry ingredients and dig yourself a nice little well in the center. That’s where you’ll be pouring your wet ingredients later. Set the bowl aside. In a small bowl, mix the instant espresso powder with the boiling water and stir. Set this aside so it can cool. In a medium size bowl, mix the granulated sugar and the brown sugar. Add the oil and stir very, very well. Stir in vanilla. 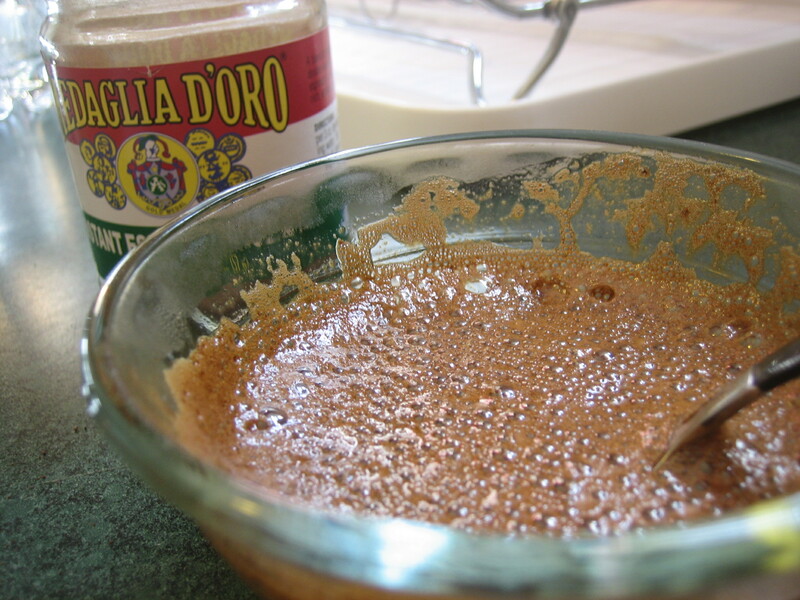 Add the water to your espresso mixture to cool it down, and pour this into the bowl, mix well. I use a whisk at this point to get everything emulsified. What you should have now is a very dark looking syrupy mixture. It’s delicious . . . taste some, I dare you. It’s like pure espresso/sugar madness! Anyway . . . The Rest . . .
Pour your wet mixture into the dry mixture. Mix well. You may need to use your hands because this makes a very stiff, very sticky dough. Line your baking sheets with parchment paper. Using your hands, take about three tablespoons of dough and make a rough ball. It should be a bit larger than a golf ball. It doesn’t have to be perfect, you’ll be squishing these in a moment anyway. 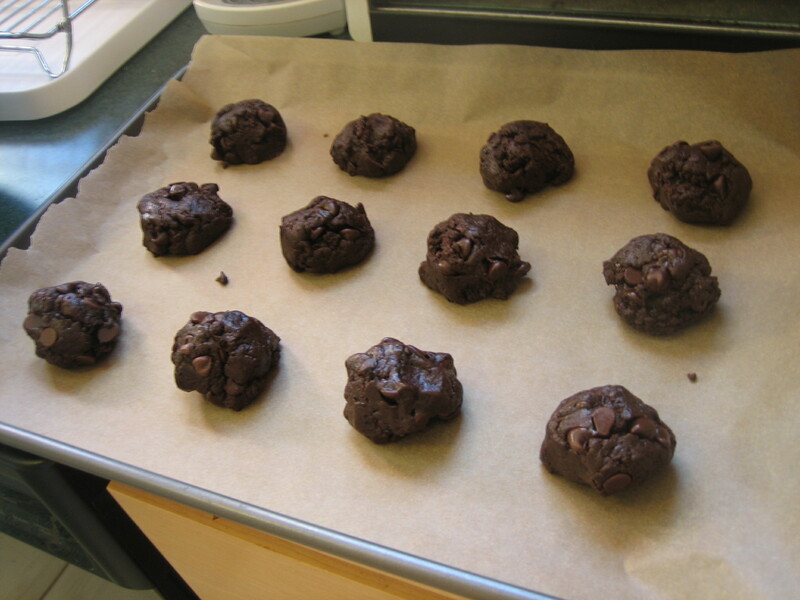 As a side note, the chocolate chips don’t like to stick to the dough very well, so be sure to bury enough of them into each ball so that there is a goodly amount of chocolate in each cookie. Because these cookies don’t spread very much, and come out of the oven about the same shape as they went in, you’re going to need to squish them. Using something flat, in my case, the bottom of a stainless steel measuring cup, squish the balls of dough down to about 1/2 an inch of thickness. Again, they don’t spread very much, so you don’t need to worry about having much space between them 1/2 – 1 inch is fine. As a hint, the dough likes to stick to anything it can, including what you’ll be using to flatten it with. What I discovered (after I squished the first pan of cookies) is that using another piece of parchment paper on the bottom of your squishing device works wonders for getting them to release cleanly. Bake at 35o for 10 minutes. 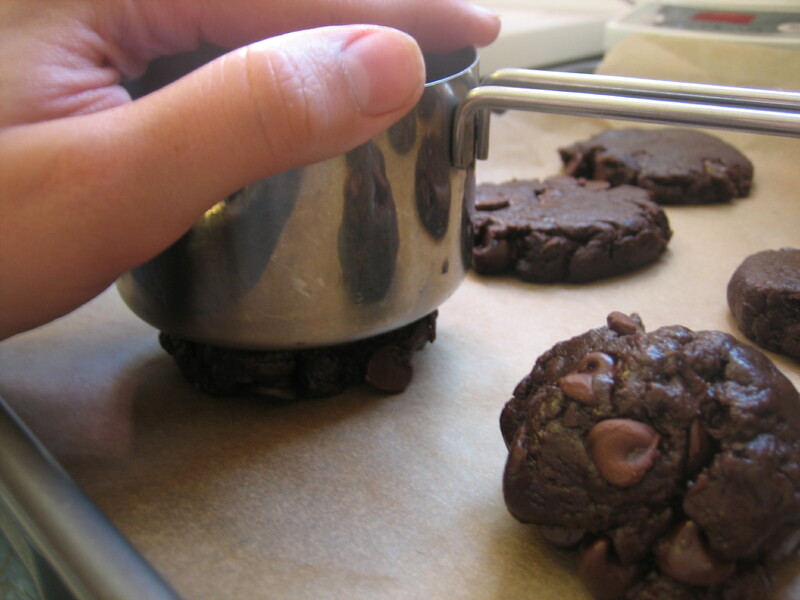 Turn the pan around about half way through the baking time if your oven tends to bake unevenly. You want these to be soft when they come out of the oven. I baked my first batch a little too long and now they’re a little firmer than I had hoped. 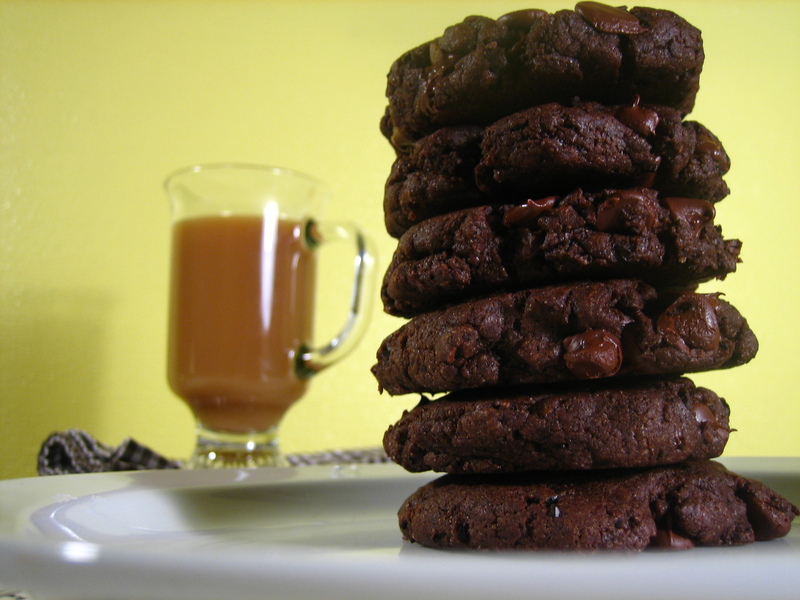 If you like firm cookies that are quite suitable for dunking, bake these 2-3 minutes longer. See, not much bigger than when they went in. When they come out of the oven, allow them to rest on the pan for 2 minutes. Then, transfer them to a cooling rack. and allow them to cool completely (yeah, right) before indulging. These are VERY caffeinated. The espresso concentrate is about 10 shots worth . . . and then there’s the coffee beans . . . and the chocolate. I haven’t calculated how much caffeine is in each cookie, and I don’t really want to. All I know is that when I sampled one, I was quite alert afterward. Still am. That’s why I’m blogging in stead of sleeping. 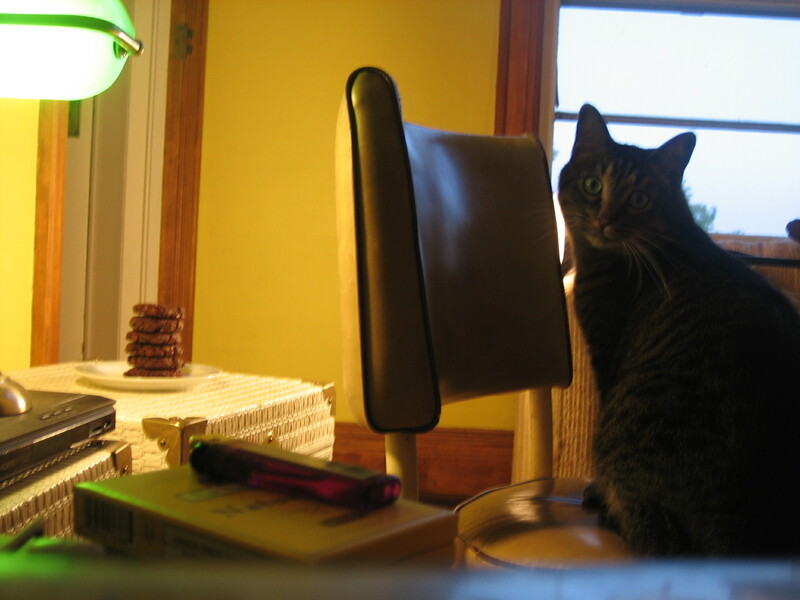 Bonus: This is Mr. Lucky. He’s trying to “help” me take good pictures for the blog . . .
Oh lordy these are good. After they cooled, I stuck the cookies in a freezer bag and put them in the fridge because I like it when the chocolate resolidifies in my chocolate chip cookies. When the flavors blended overnight in the fridge these got SO TASTY! I thought they were kind of mediocre when I tasted them last night but my good christ these are delicious. And the ground coffee in combination with the chocolate chips makes these taste like there’s bits of chocolate covered espresso beans in them. OMG I wanna go eat the whole batch! Just another quick note . . . Using the internet, I did go and estimate the caffeine content of these cookies. I couldn’t find statistics on the caffeine content of just coffee beans that weren’t brewed, so I’m guessing based on chocolate covered coffee beans. My estimation is that these have somewhere between 60 and 80 milligrams of caffeine per cookie. Two cookies contain more than a cup of coffee. I ate two this morning in stead of drinking coffee . . . 🙂 And then I had one at work when I was on break.